Beautiful and unique, this short glitter velvet party dress is sure to make fashion enthusiasts green with envy. Shimmering green velvet skims the curves in the little sheath dress and reveals the open back with daring style. A square neckline provides coverage and offers stylish shape to the front of the sleeveless bodice and contrasts well with the deep v-back. Thin spaghetti straps provide support to keep the semi-formal dress in place and adjust with ease to ensure the right fit. 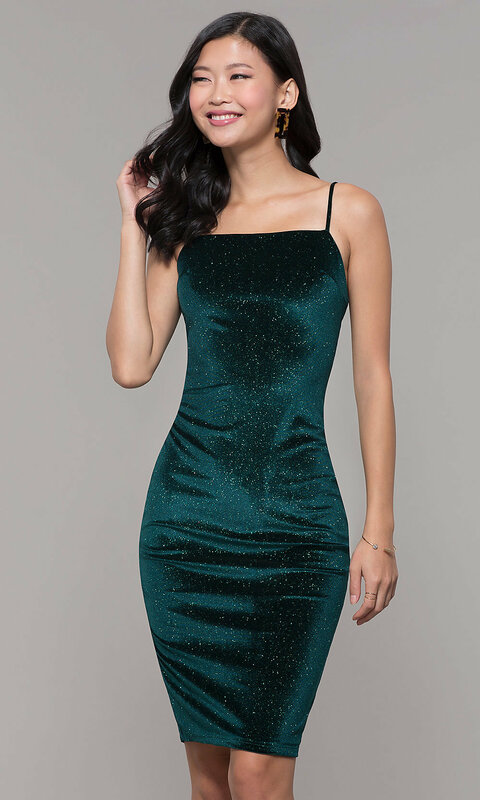 This short glitter velvet party dress offers a seamless look to the knee-length hem, and a center back slit finishes the design with a flirty touch.